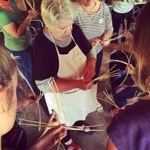 In this relaxing coiling workshop we will create a small basket or platter using materials you can collect from the garden. Coiling is an ancient technique where you wrap or stitch a weaver around core materials, in this case natural fibres. Discussion of the types of plants suitable for weaving as well as an explanation about harvesting and storing tips will be provided. All materials and notes will be supplied. Sally retired from teaching in 2008 and is a firm believer that everything has an inherent value and should not be wasted. She has been experimenting with natural fibres, grasses, vines and recycled materials found in her local environment to turn what might have been wasted into something useful and pleasing to the eye. She brings her environmental beliefs to her love of basketry in creative and sometimes unusual ways.